The Sartorialist: Video Premiere for Style.com Tomorrow!! Video Premiere for Style.com Tomorrow!! I'm so excited for tomorrows premiere of the video I produced for Style.com. It is called Intersections and will be on the new StyleStudio section of Style.com. What you will see is basically a video version of The Sartorialist. Above are a few stills that I shot for the video which are intercut between three short interviews of ladies I found that day. We were at the "intersection" of 57th & 5th so ,trust me, the ladies are pretty fab. I will post the exact link tomorrow. Comments on "Video Premiere for Style.com Tomorrow!!" Th lady in black is my typical NY woman personified! Ooooh, excellent - can't wait! i am looking forward to it the way a kid looks forward to christmas. The third picture with the lady in black, crossing the street.....is my fave! I'm in love! I am anxious to get to see the video! How can we access it? the photo of the girl in a black dress is stunning! Love the last girl. As a guy, she's dressed in a way that I consider very cute. Everything goes great and the bag and boots rock. I wish she were wearing tights instead of leggings though. the second shot reminds me -- this season's pet peeve: the enormous (and enormously ugly) black plastic chanel bag. 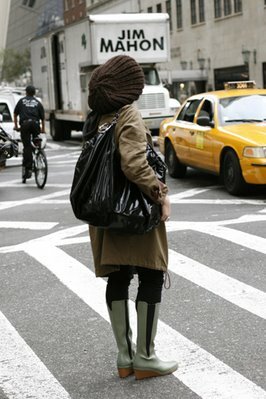 it was featured in bill cunningham's piece last sunday, and not one of the women looked good carrying it -- not one! -- which has to be some kind of a record, because i can't remember a sunday in the past god-knows-how-many years when at least one or two of the women in the shots manages to rise above the pack and make whatever it is work, no matter how ridiculous. and to think there is a long waiting list for something that is guaranteed to make you look like a fool. this is the difference between style and fashion. Is the lady in the first pic carrying a trash bag? Great boots in this post, especially the low green wedges. The woman in black looked the best. Love the shoes. New Yorkers are so effortless; I'm so jealous. i love that last girl's boots & bag, can't wait to see the video tomorrow! love it - except for the black chanel bag which is still the most hideous thing of the season. i think all the pictures are amazing. but the 3rd picture is perfection to me. "i can't remember a sunday in the past god-knows-how-many years when at least one or two of the women...manages to rise above the pack"
Hey I have those green wedges! Theyre Tretorns, featured in Lucky a couple of months ago. Good for you Sart, I cant wait to see the vids! I am addicted to your blog! I moved out of Manhattan a few years ago and miss the great style there- this is my daily update, and I have to say I'm getting more compliments on my daily wear since I started reading. Thanks! I'm going to be a rebel and say that I like the "trash bag". But that's about the only part of her outfit I like. The rest of the outfits are ok, but not that special. Your very average well dressed New Yorker. Morning expresso is getting' better! These are some of the best clothes I've seen on women in a long time-all of them, including the "trash" bag. I think it works on that picture because of those great shoes and that amazing headgear! The last woman is quite simply outsstanding, she looks gorgeous! i actually like the black chanel bag. it's one of the more youthful chanel bags - the quilted chanels are much more mature. 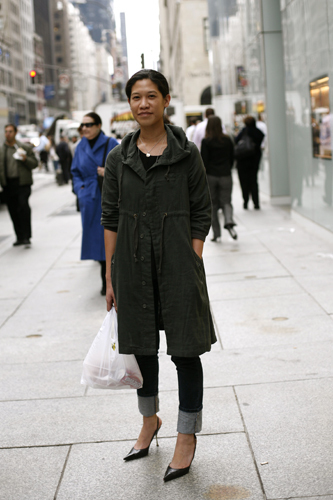 i love the photos and the style of each new yorker is so different yet still so amazing. Great... I loved the distance between The Sartorialist and any mainstream, advertising driven, publications, though PLEASE continue sucking at GQ's mediocre, at best, teet... if you're going to sell out, at least show some men. In last photo, nice combination of white leather, black leather and brown suede, not easy to wear together. #3 could be from Shaker Heights just as easily as from New York (not an insult, merely an observation). I love reading your blog, especially for your attention to detail.... So imagine my surprise to see myself in your pictures! (I'm the last girl.) Shameless validation aside, I'm truly ecstatic. Where's the link for the video? Can someone please tell me who made the suede slouchy bag (or makes similar bags)like the woman in the grey fleece jumper in the last still from this section? PLEASE HELP. I am on a hunt. Vivian, you look and dress like an angel! On the hunt: I got the bag in Hong Kong from a store called Rabeanco. I can't believe one of your subjects is actually here! Vivian, your sense of style is magnificent! Finally, those that always ask whether they can have the subject's number can actually ask you! So can I? No, just kidding, I'm on the other side of the world. But bravo on that outfit, like I said, outstanding! viv, you are fab as usual! i was so on the phone with you... :) you always push the limits of style in the best way possible! The 4th girl looks great! Def a New Yorker! i'm so proud of u darling.U doing great job.Where can i see that? anyway, but my best is the last pic, do u know who is the pretty hot lady????? Thank you so much Vivian and Candid Cool...won't be in Hong Kong anytime soon unfortunately but 'll peruse the Nordstroms (dad works for them--hell-o). By the way, i adore this site. congrats for the video! great job! i know the last girl. she IS simply fabulous and of course works in fashion. FYI. she's from LA. i love that chanel bag in the second shot! and i loved the video by the way..
LOVE the blonde crossing the street - she's gorgeous! What a great action shot.